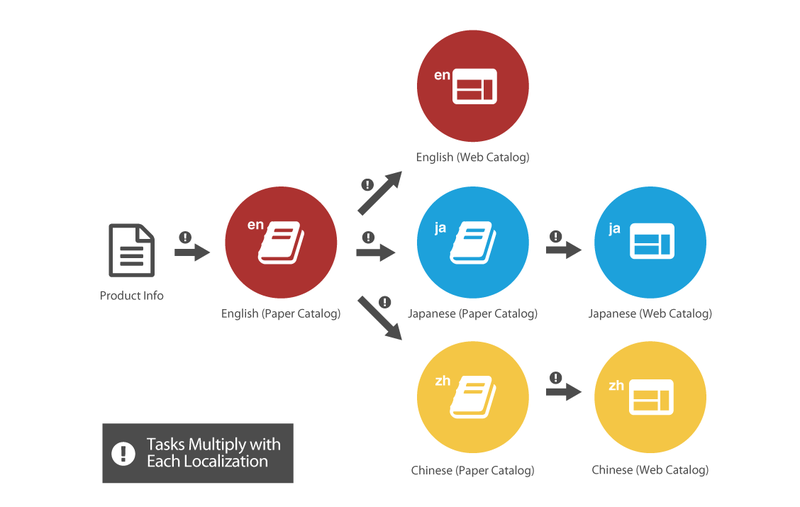 Converting Large Paper Catalogs for Web or Multilingual Editions | Akagane Inc. Client C creates product catalogs having a large volume of product information in “paper-based” as well as “web-based” versions per each market. The client’s conversion process from a paper-based version into web-based version and/or a foreign language version was labor intensive and time consuming. The client sought a business partner who would help in expediting the process without sacrificing the quality. 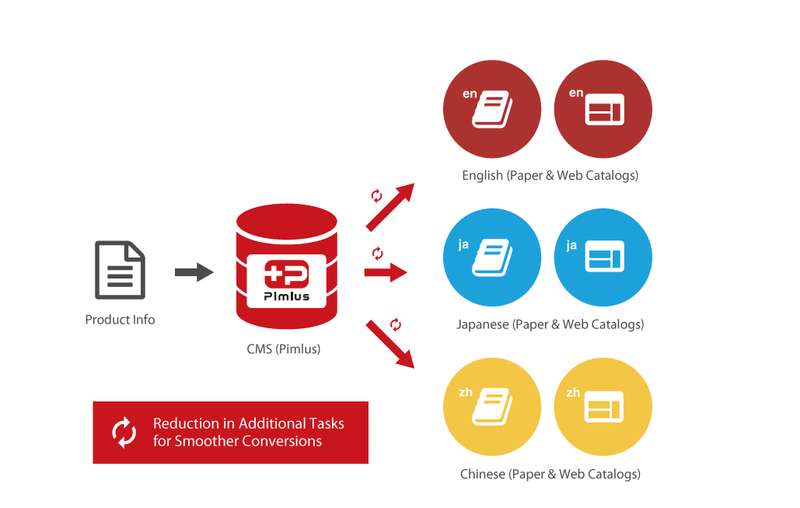 Akagane’s own in-house CMS, Pimlus, converts large-volume catalogs into different formats such as paper-based and web-based versions as well as different language editions. Pimlus has been implemented and appreciated by various manufactures and trading companies handling large amounts of production data. – Significantly reduced the amount of additional tasks incidental to the conversations, thus resulting in an increased amount of time spent by the client’s product development engineers on their real job = product development! – The data uploading process was modified to have the development engineers directly upload the product information into CMS. This change accelerated the productions of paper-based and web-based catalogs. We at Akagane make it a point to gain understanding of a client’s objectives and requirements as well as key business information such as current business processes, product data storage methods, catalog specs and target markets through the stakeholder interviews. After analyzing the gathered information, we are able to create an optimal process flow incorporating CMS implementation for the client as well as potential key benefits to be proposed to the client. Databases are one of the most important elements of an effective system, and accordingly the structure supporting such a database is a critical component. Databases house a large amount of information such as catalog specifications, product information, and design information, which may be uploaded/downloaded by many different teams in different countries. The data may be also downloaded into different computer systems. Akagane’s database specialists design the optimal database structure for your needs to ensure data integrity through data communications between your CMS and any other systems you have in place. Once the CMS is configured for a client, existing data such as product information, catalog data, etc. is migrated into the CMS in either automatic or manual processes depending upon the client’s data. In addition, we offer integration services to ensure smooth integration between the CMS and your existing database systems. Paper-based catalog data may be created from information stored in the CMS. 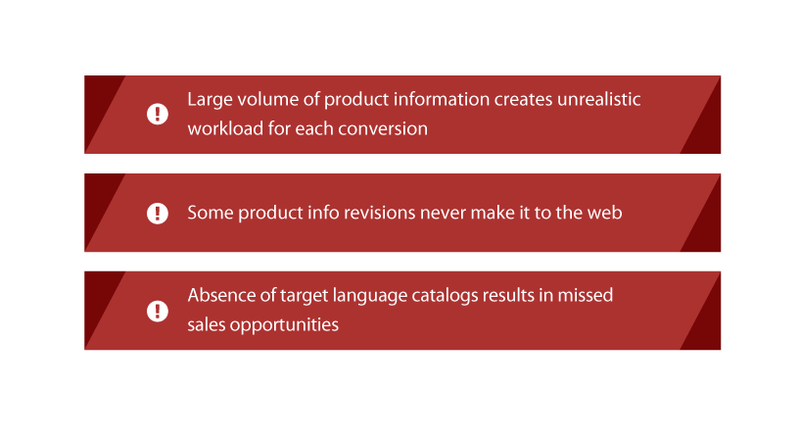 In case of different layouts for different products, our CMS can automatically generate as much catalog data as needed in order to maximize QCD (Quality, Cost, Delivery) impact. With our CMS, every change made to the production data, including conversion languages, conversion project status, original data, etc. may be managed on a product basis. Furthermore, the system is able to identify and translate the revisions from the original versions. This leads to a significant reduction in process steps and man hours. Akagane’s CMS eliminates the need for duplicating content creation and proofreading tasks for paper-based and web-based versions, allowing for simultaneous publishing and release. Akagane’s service doesn’t end with simply the CMS sale. Leveraging our industry expertise, business acumen, and technical knowledge to the fullest, Akagane provides you with end-to-end comprehensive service, from business process flow design all the way through to operation support.